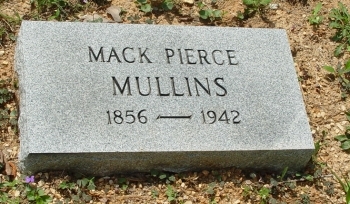 Mack Pierce Mullins, son of Adolph Mullins, husband of Willie Susie Dollar. 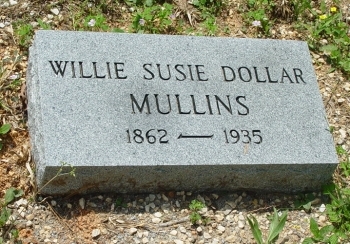 Willie Susie Dollar, daughter of Ambrose Dollar and Elizabeth Reynolds, wife of Pack Pierce Mullins. Death claimed another of Bartow County’s most beloved pioneer sons early Tuesday afternoon, when Mr. Mack Pierce Mullins, 86, one of the best known citizens in this section, who passed away at his home in the Center community shortly before one o’clock. In failing health for a number of months, Mr. Mullins’ passing comes as a shock to a host of friends. Impressive funeral services were conducted from the home Thursday morning at eleven o’clock, Rev. Mr. Bennett officiating. Interment was in Macedonia Cemetery. Owen Funeral Home in charge of arrangements. Born in Pickens County in 1856, Mr. Mullins was a son of the late Mr. and Mrs. Adolph Mullins. Coming to Bartow as a young man, he spent his long and useful life as a farmer, church worker and friend. His wife passed on seven years ago. Survivors include five sons, Messrs. J.W. and J.D. Mullins, of Atlanta, F.F., of Homestead, Florida, M.P. Jr., of Fort Payne, Alabama, and F.M. Mullins, of Tacoma, Washington; two daughters, Mrs. John Howell, of Dalton and Mrs. James Bohannon, of Savannah, Georgia. Friends by the score express deepest sympathy to members of the grief stricken family in the hour of ineffable sorrow. Funeral services for Mrs. M.P. Mullins, 73, who died at her home near Cartersville Wednesday afternoon, June 19th, will be conducted Friday morning at eleven o’clock. Rev. Mr. Bennett will officiate at the ceremony which will be held at the residence. Interment will be in the Macedonia Cemetery, Cummings-Long-Owen in charge of arrangements. Although she had been ill for several months, Mrs. Mullins was thought to be in no immediate danger, and her death comes as a blow to scores of friends throughout Bartow and Cherokee Counties. She was a native of Floyd County, having been born there in 1862, the daughter of the late Mr. and Mrs. A. Dollar, well known pioneer citizens of that county. She married Mr. Mullins while still a young girl and moved with him to this county. By that union there are seven children, five sons and two daughters all of whom are well-known in Cartersville. They include Mrs. J.D. Howell, of Cartersville; Mrs. J.K. Bohannon of Atlanta. The sons are Messrs. John, Frank, Jeff, Fred and Pierce Mullins, all of this county. Her husband also survives. The bereaved family is receiving the sympathy of their many friends over this sad loss. A Christian character, she will be missed by both old and young alike. Daughter Mrs. John Howell was Anor (Annie) Lee Mullins. Daughter Mrs. James Bohannon was Pearlena Mullins.